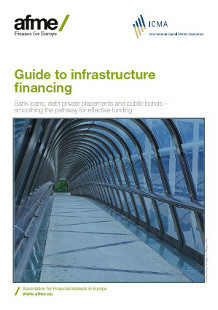 This Guide is addressed to public authorities, project sponsors, project promoters and issuers seeking to raise finance for European infrastructure projects. This Guide is one of a number of AFME and ICMA initiatives in support of the European growth agenda. AFME’s report entitled 'Bridging the growth gap: Investor views on European and US capital markets and how they drive investment and economic growth' highlighted a number of roadblocks to European infrastructure investment, including investor concerns about political and legal uncertainty and lack of access for smaller funds, which we hope this guide will help to address. AFME and ICMA are strongly supportive of the European Commission’s Investment Plan for Europe and the €315bn European Fund for Strategic Investments (EFSI). We believe that this guide can contribute to the work of EFSI by facilitating the raising of private sector finance for the infrastructure projects in which EFSI invests.